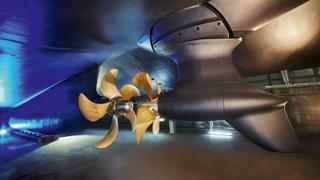 Grace E, now Nautilus, the 73m Perini Navi/Vitruvius, has a diesel-electric power plant and Azipod propulsion. Superyachts have been quietly getting greener for some time. Regulations limiting emissions from ships, known as IMO Tier I, came into force in 2005 and since then there have been two more tiers – each cutting the amount of harmful sulphur (SOx), nitric oxide (NOx) and particulate matter that yachts can emit into the atmosphere. Manufacturers have come up with various clever ways to meet these increasingly strict standards – catalytic reducers, exhaust scrubbers and by simply making the combustion process more efficient. But as the industry faces a future of even tighter regulation, and in an era of volatile diesel prices, it has become necessary – and expedient – to ask the simple question: what comes next? The obvious choice in the hunt for cleaner alternatives is to look at biofuel, hydrogen gas, hydrogen fuel cells and liquefied natural gas (LNG). 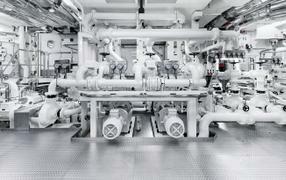 According to classification society DNV GL Maritime, LNG is the only price-competitive fuel that can meet existing and phasing-in regulations to limit SOx, NOx, particulates and CO2 emissions without additional process technology such as scrubbers, filters and catalytic converters. It’s an idea that’s gaining traction. BMT Nigel Gee is building two 70 metre LNG-powered ferries for service in the Netherlands and, according to Cruise Industry News, 13 of the 73 (yes, 73) new cruise ships on order are to be powered by LNG. On 15 April, the International Maritime Organisation reached an agreement to cut CO2 emissions on ships by 50 per cent by 2050. Much, but not all, of those savings will be expected to come from a switch to LNG in the commercial sector. But LNG has some disadvantages for the leisure market, says James Roy from BMT Nigel Gee. “It has an energy density of between 50 and 60 per cent of diesel; therefore the volume of fuel tanks for the same range is higher for LNG.” LNG is inherently more combustible and requires more safety measures than diesel, and it is much more complicated to construct an LNG tank than a diesel tank. “A shift to this fuel for yachts is unlikely unless there is a seismic shift in [LNG] access, acceptance of reduced range by yacht owners and [increased] regulation eliminating diesel exhaust in ports, harbours and special environmental areas,” says Roy. The Netherlands, which has committed to fossil-free ferries, and Norway, an earlier adopter of diesel-electricand electric-only ferries, are both leaning towards hydrogen fuel cell technology for marine application. Hydrogen can be supplied as a pure gas held in tanks or manufactured on site through several processes, including solar collectors, wind-powered electrolysis and reforming, a process in which air, steam and a fossil fuel such as diesel or LNG are forced through a membrane to extract hydrogen-rich gas and trap sulphur. While reforming reduces the hydrogen storage issue, the system is very complicated and voluminous, according to a spokesperson for BMT Nigel Gee. But work persists on other hydrogen methods. 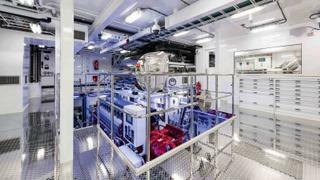 In the autumn of 2016, PowerCell Sweden AB was contracted to install a pair of prototype fuel cell S3 stacks on a Norwegian ship that will create its own hydrogen from solar electricity, thereby quadrupling its autonomy. Much of the basis for PowerCell’s development comes from a research programme by Volvo, which saw hydrogen as a suitable fuel for trucks, buses and heavy equipment. A factor that makes hydrogen interesting to the marine industry is the efficiency of fuel cells versus lithium-ion batteries. The PowerCell products weigh 32.3kg per 100kW (135hp) of output and can be stacked in series depending on the required power. Shipping is crucial for linking locations along the Norwegian coast and can cut travel times by half, according to Andrea Boden, spokesman for PowerCell. “At the same time, today’s motor vessels generate the highest emissions per passenger kilometre, which implies a great potential for fuel cells in the marine industry,” he says. The US Naval Research Laboratory is experimenting with turning seawater into fuel by desalinating it and splitting H2O into hydrogen gas, which is captured, and oxygen, which is vented. The only current problem is that the power needed to make enough hydrogen to power a warship is about equal to the energy output of a nuclear aircraft carrier. The technology, if scalable, is promising. In the meantime, hydrogen could be used to support auxiliary operations and longer periods of silent running. Energy Observer just celebrated its first anniversary of green power by beginning its 2018 Mediterranean tour. 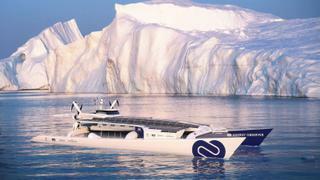 This 30.5 metre catamaran was developed for a six-year circumnavigation using only renewable energy and hydrogen gas. Its electric propulsion motors are powered by solar cells and wind turbines during the day and by fuel cells charging its battery banks at night. It will use electrolysis to charge its hydrogen fuel cells. The entire power generating system weighs 2,100kg. New, lighter batteries will be installed in 2019. Sandia National Laboratories says it has an advanced concept for a zero-emissions, 35-knot, 150-passenger, electric ferry for San Francisco Bay powered by hydrogen fuel cells. The development was funded by the US Department of Transportation’s Maritime Administration and led by Sandia, a division of Lockheed Martin. The hydrogen ferry would cost about twice as much as a comparable diesel ferry at today’s prices. Much of that cost is in the fuel cell system. “Right now, we can’t achieve economic parity with a comparable diesel ferry,” says Sandia researcher Joe Pratt, “but this is a question we need to explore further. Is economic parity necessary from the outset? Lessons from the automotive market tell us maybe not.” In fact, a fleet of hydrogen-powered taxis called Hype Taxis has been operating in Paris since 2015. The fleet of cars, now up to 75, have a range of 500 miles and can refuel in three to five minutes, unlike electric cars which take hours to recharge. The savings in time to refuel versus time to recharge are proving popular. For years we have been hearing that the only major impediment in the development of green, electric-powered yachts is the lack of advanced storage batteries. 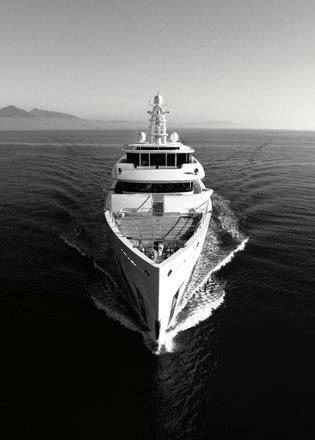 Although the average lithium-ion battery is four times as energy dense as lead acid and has a greater life cycle expectancy, especially in hot climates, even the latest lithium-ion batteries offer only about 10 per cent of the energy of diesel fuel – not “power-dense” enough to run a superyacht and its house loads for more than a few hours in the best conditions. 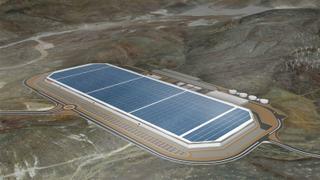 Newer batteries – the phrase is “post-lithium-ion” – appear to be moving to lithium-air or lithium-metal for higher energy density, in some cases twice as much. The newest battery technology research takes several forms. Magnesium-ion, lithium-oxide, lithium–sulphur, sodium-ion, hydrogen-bromide and sodium-oxygen are some of the combinations that have been tried. Many offer far greater power densities but material prices and other problems are limiting these technologies to the laboratories for now. In these same labs, supercomputers are analysing thousands of anode materials and electrolytes to see if any offer increased power densities at a reasonable price. At Harvard, researchers are working on an organic-flow battery that promises a huge advance. The design is proven, but its organic chemical lifespan is proving more difficult. This battery uses quinones, a water-soluble organic compound derived from aromatic compounds such as benzene and naphthalene from cheap and abundant sources – oil waste and rhubarb, for example. The “rhubarb” flow battery is reputed to have reaction times 1,000 times faster than lithium-ion batteries and uses far less expensive materials. A prototype is being built in Italy. Vanadium as an electrolyte also shows great promise. There is a vanadium redox-flow battery being tested in South Africa that displays 450kWh of power packed into a case the size of a six metre storage container. Too big for a car or truck, of course, but certainly manageable on a superyacht. Jeroen Droogsma, head of design studies at Vripack, has been working with solar-powered boats for 10 years. What started as a team-building exercise to compete in a solar-powered boat race became a real passion and led to the development of a one-design class of solar boats for racing. While racing is one thing, Vripack is working on improved efficiency as well. 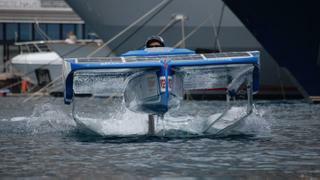 The current record for its solar-powered boat is 240 kilometres in four days without recharging from shore. “In 10 years, there will be a great improvement in solar-generated electricity,” says Droogsma. “Regulations will drive it. In Holland, in two years all the new canal boats being constructed for Amsterdam will have to be zero-emission.” And all existing canal cruise boats must be zero emissions by 2025. First published in the June 2018 edition of Boat International.